On this date in 1571, Anabaptist Hans Haslibacher was martyred in Bern, Switzerland. 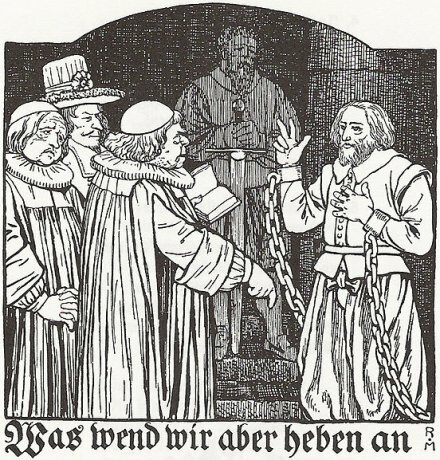 Haslibacher (German link) joined the oft-suppressed movement in 1532 and quickly established himself as one of the most energetic proselytizers in the Emmental in Bern canton. The town fountain would spew blood. The Swiss Anabaptists are noteworthy as the confessional ancestors of the present-day Amish: the latter sect is named for 17th century Bern canton Anabaptist Jakob Ammann, who was the leader of one faction in a 1693 schism within the Swiss Anabaptist community. Fortunately (though not for this here site) that schism emerged too late in the day for a classic religious martyrdom. Hans Haslibacher, in fact, was the last Anabaptist put to death for his faith in Bern. Just to be pedantic: it’s actually a song rather than a poem (‘lied’ is German for song) that was composed about him. It’s set to the tune ‘Warum betrubst du dich mein Herz’ which was (and is) a popular chorale, a folk hymn sung by the Lutheran congregation, and it’s a tune often used for songs about executed criminals in the German lands. But what’s fascinating about this one is that it’s a song that proclaims his innocence – the opposite of most of these types of songs.